FLORIA Women Button Down V-Neck Long Sleeve Soft Knit Cardigan Sweater Navy M by FLORIA at Mas Fashion. MPN: 43235-122580. Hurry! Limited time offer. Offer valid only while supplies last. This comfortable, casual, elegant and classy button down v-neck cardigan sweater comes in multiple colors, making it a perfect fit for any occasion. 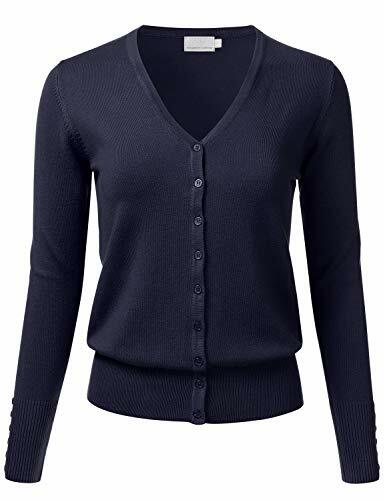 This comfortable, casual, elegant and classy button down v-neck cardigan sweater comes in multiple colors, making it a perfect fit for any occasion. This soft fitted knit cardigan sweaters are made out of high quality material. Soft Knit Button Down V-Neck Long Sleeve Cardigan With Buttons / Features button down collar, buttoned sleeve cuffs, ribbed hem and sleeves. FLORIA is a registered trademark brand for women's clothing. Manufactured by Cielo. Sold by Floria.